Siem Reap daily package tours. Let me take care of your trip!! I went to Siem Reap last summer with 2 of my girlfriends from Hong Kong, and Mr. Kosal (or Nicky, as we know him) made our trip PHENOMENAL. Nicky is incredibly personable and professional, and he struck a great balance of giving us great guidance on where to go and letting us do what we wanted to. We were referred to Nicky through a friend who had visited the previous year with her family, and since then, we’ve made many recommendations to our own friends/family to contact Nicky. In fact, I am returning to Siem Reap in a few weeks, and have asked Nicky to be our tour guide again! if you visit Siem reap do not forget to contact him. Nicky will work with you in making the perfect trip for you or your group prior to or upon your arrival in Siem Reap. I made a recent trip to Siem Reap from 8th to 11th December and was glad to have Kosal coordinating my tour in Siem Reap. I find it a hassle to come up with my own itinerary and Kosal designed a itineray that is well planned and well paced and definitely to my liking as it covers visits to major temples. Although Kosal had other tours on some days, he found me knowledgeable, friendly and perceptive guides. On the day he brought me Angkor Wat, he provided excellent explanations which allowed me to learn more about the history, the architecture and the culture. I found Kosal while searching for a guide over the net and I have not regretted my choice. I will certainly recommend Kosal to anyone who is planning a trip to Siem Reap as my stay in Siem Reap has been made more meaningful in the company of an outstanding guide. I am sure I will return to Siem Reap in the near future and I have no doubts that I will be contacting Kosal once again to bring me around. I traveled for 6 weeks in Asia and Siem Reap, Cambodia was probably my favorite destination of them all in part due to the awesomeness of the Angkor Wat temples, but mostly due to our wonderful tour guide, Nicky. Nicky really made our 3 days in Siem Reap such a great experience by planning out an itinerary for us that suited our needs, providing cold bottled water at all times as we trekked through the heat, and was just incredibly nice and friendly through it all. He was very knowledgeable about the history, the culture and seems to genuinely like what he does. His English is impeccable, he was professional, and we had such a great time with him. He was recommended to us by a friend, and I would highly recommend him to anyone who is thinking of going to Siem Reap. I thought that the temples might start to look the same after a while, but thanks to Nicky, each temple was it’s own unique experience with its own story and history. He also had an air conditioned car that made it very easy for transport to and from the airport, and around all the temples. 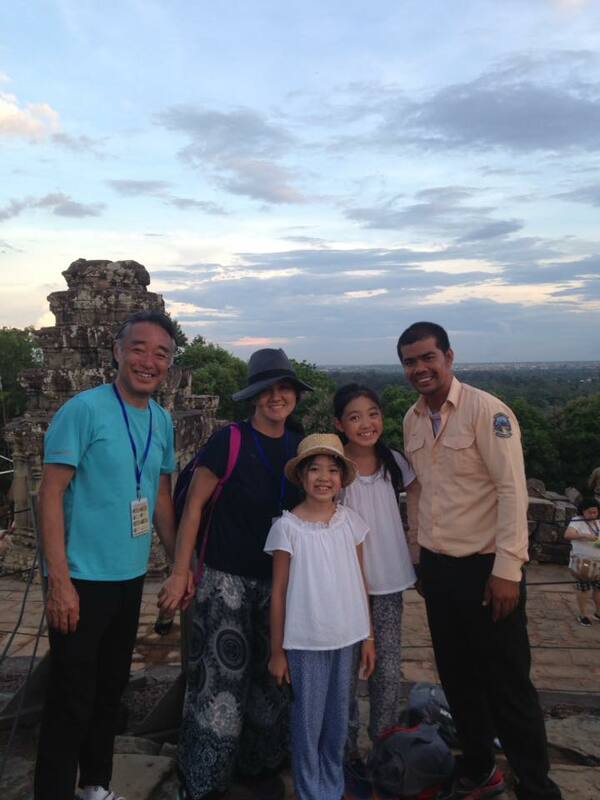 His rates are also really reasonable and I think whether you’re going solo, with a family, friends, or in a couple, Nicky will make sure you have a great experience in Siem Reap. You can’t go wrong with Nicky!